From the Departments of Neurology (R.I., N.S., M.T., M.K., H.W., M.A.) and Medical Genetics (R.I., T.N., Y.A. ), Tohoku University Graduate School of Medicine, Sendai, Japan; Department of Neurology (T.T. ), National Hospital Organization Sendai-Nishitaga, National Hospital, Sendai, Japan; Department of Neurology (M.T. ), Iwate National Hospital, Ichinoseki, Japan; Department of Neurology (C.W. ), Hiroshima-Nishi Medical Center, Hiroshima, Japan; Department of Neurology (K.S. ), Nara Medical University, Nara, Japan; and Department of Neurology (H.N.) and Research Division for Neurodegeneration and Dementia (G.S. ), Nagoya University Graduate School of Medicine, Nagoya, Japan. Objective: To investigate the genetic causes of suspected dysferlinopathy and to reveal the genetic profile for myopathies with dysferlin deficiency. Methods: Using next-generation sequencing, we analyzed 42 myopathy-associated genes, including DYSF, in 64 patients who were clinically or pathologically suspected of having dysferlinopathy. Putative pathogenic mutations were confirmed by Sanger sequencing. In addition, copy-number variations in DYSF were investigated using multiplex ligation-dependent probe amplification. We also analyzed the genetic profile for 90 patients with myopathy with dysferlin deficiency, as indicated by muscle specimen immunohistochemistry, including patients from a previous cohort. Results: We identified putative pathogenic mutations in 38 patients (59% of all investigated patients). Twenty-three patients had DYSF mutations, including 6 novel mutations. The remaining 16 patients, including a single patient who also carried the DYSF mutation, harbored putative pathogenic mutations in other genes. The genetic profile for 90 patients with dysferlin deficiency revealed that 70% had DYSF mutations (n = 63), 10% had CAPN3 mutations (n = 9), 2% had CAV3 mutations (n = 2), 3% had mutations in other genes (in single patients), and 16% did not have any identified mutations (n = 14). Conclusions: This study clarified the heterogeneous genetic profile for myopathies with dysferlin deficiency. Our results demonstrate the importance of a comprehensive analysis of related genes in improving the genetic diagnosis of dysferlinopathy as one of the most common subtypes of limb-girdle muscular dystrophy. Unresolved diagnoses should be investigated using whole-genome or whole-exome sequencing. Dysferlinopathies are a group of autosomal recessive muscular dystrophies caused by mutations in DYSF. There are 3 main phenotypes: Miyoshi muscular dystrophy 1 (MMD1; OMIM #254130), limb-girdle muscular dystrophy type 2B (LGMD2B; OMIM #253601), and distal myopathy with anterior tibial onset (OMIM #606768). DYSF is located on chromosome 2p13.3-p13.1. It is composed of 55 exons coding for 2,080 amino acid residues, which form the dysferlin protein (approximately 230 kDa).1 Dysferlin is expressed in the plasma membrane of skeletal muscles2 and is involved in calcium-mediated membrane fusion events and membrane repair.3,4 Patients with DYSF mutations have very low levels of dysferlin expression in skeletal muscle membranes (called primary dysferlinopathy).2,5,6 Secondary dysferlin deficiency or altered localization due to mutation of the non-DYSF gene has also been reported in patients with dystrophinopathy,7 sarcoglycanopathy,7 caveolinopathy,8,–,10 or calpainopathy8,11,–,13 (often classified as secondary dysferlinopathy). Thus, the definitive diagnosis of dysferlinopathy requires identification of the DYSF mutation. Since 1998, our group has performed mutation analysis for DYSF in more than 160 families suspected of having dysferlinopathy using PCR–single-strand conformational polymorphism analysis or Sanger sequencing.1,14,15 We previously identified >50 different mutations across the entire DYSF gene in approximately 60% of the patients.1,14,15 We did not find DYSF mutations in the remaining approximately 40% of the patients, which suggests that these patients may have mutations in other myopathy-associated genes. The aim of this study was to conduct targeted next-generation sequencing of myopathy-associated genes to reanalyze the patients with suspected dysferlinopathy who did not previously show DYSF mutations. This should enable us to reveal the genetic profile for myopathies with dysferlin deficiency. This study was approved by the Ethics Committee of the Tohoku University School of Medicine, and all individuals gave their informed consent before their inclusion. Cohort for targeted next-generation sequencing (cohort 1). PCR–single-strand conformational polymorphism analysis or Sanger sequencing of DYSF had previously been performed in 150 probands with suspected dysferlinopathy: 98 of them (65.3%) were diagnosed with DYSF mutations and 52 (34.7%) remained undiagnosed, with no pathogenic mutation in 43 and single heterozygous mutations in 9 (table e-1 at Neurology.org/ng). A total of 64 patients, including the above-mentioned prescreened but undiagnosed 52 patients and 12 newly enrolled patients, were analyzed using targeted next-generation sequencing. Of the 64 patients analyzed, a deficiency or reduction in sarcolemmal dysferlin was confirmed in 41 patients using immunohistochemical analysis of dysferlin in muscle samples (classified as “pathologically proven cases”), whereas dysferlin deficiencies were not confirmed in the remaining 23 patients, mainly because muscle biopsies or immunohistochemical analyses for dysferlin had not been performed (classified as “clinically suspected cases”) (table 1). All of the 23 patients had teenage-to-adult–onset slowly progressive myopathy without predominant cardiac dysfunction or early-onset respiratory dysfunction with at least 1 of the dysferlinopathy-likely phenotypes: initial or strong involvement of the flexor muscles in distal lower limbs (15 of 23 patients) or a moderate-to-extreme increase (>1,000 IU/L) in serum creatine kinase (CK) levels (12 of 23 patients). Cohort for analyzing the genetic profile in the pathologically proven cases (cohort 2). To analyze the genetic profile in the pathologically proven cases, the 47 patients with previously identified DYSF mutations1,14,15 and the 2 patients with CAPN3 and CAV310 mutations were combined with the aforementioned 41 undiagnosed but pathologically proven cases, amounting to a total of 90 patients in this cohort (table 1). Immunohistochemical analysis for dysferlin in muscle samples was performed in the institution or hospital that the patient visited. Although the detailed methods may not have been identical in all cases, most cases were investigated by the avidin–biotin–peroxidase complex immunostaining method using the mouse monoclonal antibody to dysferlin (NCL-Hamlet; Leica Biosystems, Wetzlar, Germany) as the primary antibody. We selected 42 genes that have been reported to cause adult-onset myopathy or muscular dystrophy (table 2). The targeted regions were designed using the SureDesign system (Agilent Technologies, Santa Clara, CA) to include all coding exons with 3′ and 5′ intronic 25-bp flanking bases (the regional source for coding exons was extracted from RefSeq, CCDS, Ensemble, Gencode, or Vega databases) and 3′ and 5′ untranslated regions. The targeted region for DYSF was designed to include 58 exons (i.e., exon 1–55, the alternative first exon, and exons 5a and 40a) to cover all alternative spliced variants. Of the total targeted region of 498.98 kb, 488.98 kb (98.08% coverage) was expected to be covered by 17,143 amplicons. Genomic DNA from the targeted region was captured using the HaloPlex target-enrichment system (Agilent Technologies). Targeted libraries were sequenced using the MiSeq platform, according to the manufacturer's instructions (Illumina, San Diego, CA). Paired 151-bp reads were aligned to the reference human genome (UCSChg19) using the Burrows–Wheeler Alignment tool.16 Single-nucleotide variants and indels were identified using the Genome Analysis Toolkit v1.5.17 Single-nucleotide variants and indels were annotated against the RefSeq and Single Nucleotide Polymorphism databases (dbSNP137) in the ANNOVAR program.18 We used the PolyPhen-2 polymorphism phenotyping software tool and SIFT19,20 to predict the functional effects of mutations and eXome-Hidden Markov Model (XHMM, http://atgu.mgh.harvard.edu/xhmm/) to call copy-number variations. We extracted variations that were listed as myopathy-causing mutations in the Human Gene Mutation Database (HGMD; provided by BIOBASE, Waltham, MA). For further analysis, we filtered variations satisfying all of the following conditions: variations located in exon or splice sites that were not detected in the control DNA included in the HaloPlex target enrichment system, variations that were covered by a minimum of 20 reads with a genotype quality score of at least 80, and variations with an altered allele frequency that ranged from 0.3 to 0.7 in the heterozygous state or that was greater than 0.7 in the homozygous state. Among these, nonsynonymous variants that either were absent or had a frequency of <1% in both the 1000 Genomes Database and the Human Genetic Variation Database (http://www.genome.med.kyoto-u.ac.jp/SnpDB/) were left as rare variants. We performed Sanger sequencing to confirm that the mutations identified by exome sequencing segregated with the disease. PCR products were purified using a MultiScreen-PCR plate (Millipore, Billerica, MA) followed by sequencing with a 3500xL Genetic Analyzer (Thermo Fisher Scientific, Waltham, MA). To investigate copy-number variation in DYSF, we performed multiplex ligation-dependent probe amplification (MLPA) with SALSA MLPA probemix P268-A1 DYSF (MRC Holland, Amsterdam, the Netherlands) according to the manufacturer's instructions. This MLPA design contains probes to amplify 40 of the 58 exons. Genomic DNA (50–250 ng) was hybridized using the probemix. After ligation and amplification, the PCR products were separated by size using a 3130xL Genetic Analyzer (Thermo Fisher Scientific). Relative peak areas were calculated with GeneMapper software (Thermo Fisher Scientific). To investigate the allelic condition of multiple heterozygous mutations in a particular gene, we performed subcloning of PCR products. Long-range PCR was performed under optimized long-PCR conditions using LA Taq polymerase (Takara, Shiga, Japan). The PCR products were subcloned into the vector pCR2.1 TOPO (Invitrogen, Waltham, MA). Several clones were randomly picked from each bacterial culture, and DNA was extracted for Sanger sequencing. An average of 96.8% (92.6%–98.2%) and 93.7% (84.6%–97.6%) of the overall targeted regions had at least 10- and 30-fold coverage, respectively (table e-2). The average read depth calculated for each gene ranged from 207 (GFPT1) to 429 (CAV3). An average of 89.7% (FKRP) to 99.9% (CAPN3) of the targeted regions had at least 10-fold coverage, and 83.1% (FKRP) to 99.4% (TRIM32) of the targeted regions had at least 30-fold coverage. These regions corresponded to those estimated to have been uncaptured by any amplicon. The sequencing data covered 99.4% and 98.1% of the targeted DYSF region with at least 10- and 30-fold coverage, respectively, with an average read depth of 388. With reference to the HGMD, 0–3 myopathy-causing mutations were extracted per individual. After filtering with the quality-related and frequency thresholds described earlier, 0–17 rare nonsynonymous variants remained per individual. After considering the predicted functional effect, pattern of inheritance, and clinical information, putative pathogenic variants were detected in 38 of 64 patients (26 of 52 prescreened undiagnosed patients and all 12 newly enrolled patients). Twenty-three of the 38 mutation-positive patients (12 of 52 prescreened undiagnosed patients and 11 of 12 newly enrolled patients) had DYSF mutations; these included 6 novel mutations (tables 1 and 3). Novel homozygous deletion of exons 37 and 38 (Dys194-1) and heterozygous deletion of exons 37 to 41 (Dys119-1-2) were predicted by XHMM software and confirmed by MLPA and Sanger sequencing, which revealed deletions of 5,862 and 51,161 bps, respectively. The remaining 16 patients (15 of 52 prescreened undiagnosed patients and 1 of 12 newly enrolled patients), including a single patient (Dys149-1) in whom the DYSF mutation was simultaneously detected, were revealed to harbor known or rare mutations in non-DYSF genes (tables 1 and 4). Of these, novel or known mutations in CAPN3 were detected in 10 patients, accounting for the majority of non-DYSF genes. The heterozygous p.V805A mutation in MYH2, which is a known mutation leading to inclusion body myositis,21 was detected in Dys86-1. The pathogenicity of this mutation remained uncertain because of the lack of relevant information in muscle pathology. Subsequently, MLPA was performed for the remaining 27 patients (table e-1), including all 14 patients who were undiagnosed after targeted sequencing but were pathologically proven, through targeted next-generation sequencing. We detected no additional duplications or deletions in DYSF (table e-1). Genetic profile for pathologically proven cases. Figure 1 shows the genetic profile of the 90 pathologically proven cases (patients who showed sarcolemmal dysferlin deficiency in immunohistochemical analyses). Intriguingly, the 63 patients (47 previously diagnosed patients and 16 newly diagnosed patients) with DYSF mutations accounted for only 70% of cases, CAPN mutations accounted for 10% of cases (9/90), and CAV3 mutations accounted for 2% of cases (2/90). The other genetic profile included mutations in ANO5, GNE, and MYOT (together with CAV3 and DYSF), each of which was detected in a single individual. Clinical information for the remaining 14 patients who showed secondary dysferlin deficiency due to putative pathogenic mutations in non-DSYF genes is summarized in table 5. DYSF mutations were identified in a total of 63 patients (70%). Nine patients (10%) were diagnosed with CAPN3 mutations. Of the 90 patients, 38 and 41 manifested as distal myopathy (DM) and limb-girdle muscular dystrophy (LGMD), respectively, and the remaining 11 were unclassifiable. The genetic profiles for each manifestation are also shown. 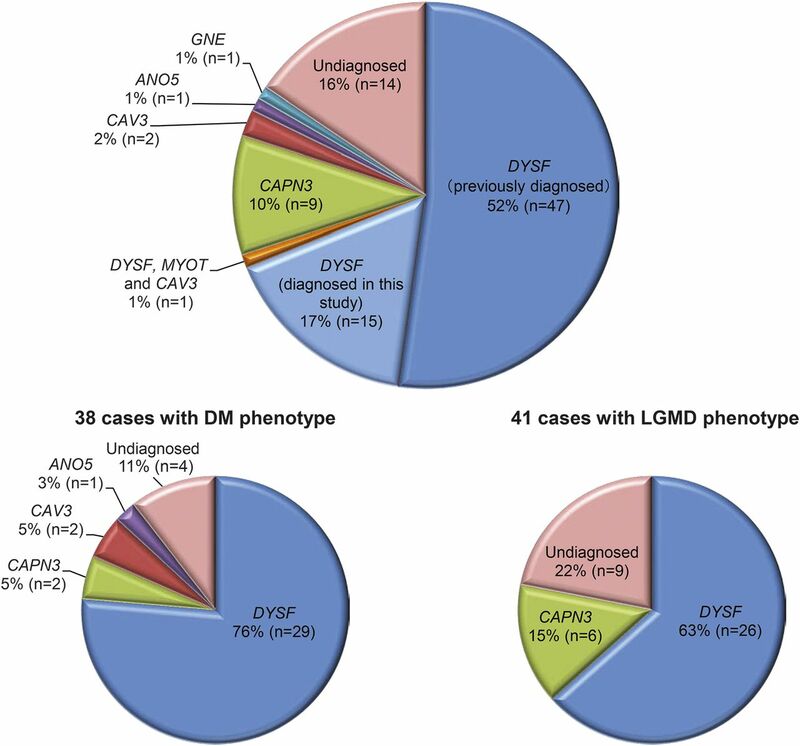 The proportion of DYSF mutations was more frequent for the DM phenotype (76%) than for the LGMD phenotype (63%), whereas CAPN3 mutations were more frequent in the LGMD phenotype (15%) than in the DM phenotype (5%). We performed targeted next-generation sequencing of 42 myopathy-associated genes in 64 patients with clinically or pathologically suspected dysferlinopathy. We found possible pathogenic mutations in DYSF or other genes in 38 patients (59.4%). The use of this targeted resequencing technique improved positive genetic detection from 65.3% (98/150 patients) to 82.7% (124/150 patients) overall, owing to (1) the detection of previously unrevealed DYSF mutations, including gross deletions, and (2) the comprehensive sequencing of non-DYSF genes and the detection of novel or known mutations in these genes. Although secondary dysferlin deficiency can be caused by CAPN3 mutations,11,–,13 the exact frequency of CAPN3 mutations in patients with dysferlin deficiency has not been reported previously. Human CAPN3 is located on chromosome 15q15.1-15.3, comprises 24 exons, and codes a Ca2+-dependent cysteine protease called calpain 3 (p94). Across the entire CAPN3 gene, nearly 300 mutations have been reported to be pathogenic and the cause of LGMD2A (OMIM #253600),22 which is estimated to be the most frequent type of LGMD in the Japanese population.8 In this study, although mutations in CAPN3 were essentially distributed sporadically, thus not suggesting a specific genotype to associate with dysferlin deficiency, our result of 10% frequency in CAPN3 mutations with dysferlin deficiency emphasizes the necessity for genetic analysis of both genes. Clinically, 2 of the 9 patients with CAPN3 mutations manifested atypically with a distal myopathy (DM) phenotype rather than LGMD (figure 1, table 5). One of the patients with DM (Dys189-1) had weakness of the tibialis anterior muscle as an initial symptom and showed gastrocnemius muscle atrophy, closely resembling MMD1 (table 5). Immunohistochemistry for calpain 3 revealed reduced expression in this patient. The other patient (Dys88-1) also had distal weakness with wasting, particularly in the tibialis anterior muscle. Although immunohistochemistry for calpain 3 was rarely investigated in our cases of dysferlinopathy, a secondary reduction in calpain 3 with DYSF mutations has also been reported.23 These findings indicate that it is difficult to distinguish calpainopathy from dysferlinopathy, even when considering clinical information together with immunohistochemical analysis of both proteins. Genetic analysis of both genes would be valuable for genetic counseling, clinical management,24 and possible specific genetic therapies in the future. Non-DYSF and non-CAPN3 genes were responsible for 5% of patients with dysferlin deficiencies (figure 1, table 5). A novel CAV3 mutation was identified in Dys203-1, and immunohistochemical analyses in this patient showed reduced expression of both dysferlin and caveolin, confirming the diagnosis. Together with the known homozygous p.L556P mutation in DYSF, a known heterozygous p.R405K mutation in MYOT and a rare mutation of p.V14I in CAV3 were detected in 1 patient (Dys149-1). This patient was a sporadic case with isolated hyperCKemia. Thus, it is unknown whether the muscle pathology showing absent dysferlin was caused by the DYSF mutation or by the associated effects of multiple mutations. A novel homozygous ANO5 splicing mutation was identified in Dys201-1. ANO5 encodes the transmembrane protein anoctamin 5 and is the causative gene for MMD3 (OMIM #613319) and LGMD2L (OMIM #611307). Asymmetrical muscle atrophy was predominantly observed in the gastrocnemius, biceps femoris, and adductor magnus in this patient and is a possible distribution in both MMD1 and MMD3.25 Expression of dysferlin in this patient was diffusely decreased, mimicking MMD1 (figure e-1). A homozygous GNE mutation was detected in Dys91-1, compatible with DM with rimmed vacuoles, and this patient had a partial reduction in dysferlin (figure e-1). Secondary dysferlin deficiency from mutations in ANO5 or GNE has not been reported previously. Hence, further investigations are required to clarify the possible association between these mutations and dysferlin deficiency. Even after the targeted next-generation sequencing, 26 of 64 patients (40.6%) remained undiagnosed. This means that undiagnosed patients accounted for 15.6% of pathologically proven cases (14/90 patients) and 16.2% of clinically suspected cases (12/74 patients), showing nonsignificant difference between the 2 groups (table 1). There are several possible explanations: (1) mutations in subtle unsequenced targeted regions were not detected in this study; (2) intronic DYSF mutations that might result in abnormal splicing were not detected because these regions, along with messenger RNA, were not investigated; (3) pathogenic mutations were excluded because of biased filtering or overfiltering; or, most probably; (4) other genes not targeted in this study may be responsible. More than 50 molecules have been reported to interact with dysferlin.26,–,32 These molecules are encoded by a fraction of genes such as CAPN3, CAV3, DES, FLNC, and FHL1, which are already known to cause myopathies. The remaining molecules may well be the next candidates. The identification of novel molecules that cause dysferlin deficiency can help elucidate the mechanisms by which dysferlin achieves membrane repair. The study had a few limitations. The targeted genes in this study did not include the DMD gene, whose mutation is reported to result in secondary dysferlinopathy.7 The immunoblot assay of muscle samples was not performed because muscle samples were not available. Thus, the quantitative level of dysferlin expression in sarcolemma or cytoplasm remains undetermined. The allelic zygosity of the multiple heterozygous candidate variants was not confirmed in all patients for the following reasons: (1) long-range PCR was unsuccessful if the distance between variants was too long or genomic DNA was estimated to be fragmented, or (2) there was a lack of available genomic parental DNA. We used targeted next-generation sequencing to effectively and comprehensively analyze mutations in myopathy-associated genes and to clarify the heterogeneous nature of the genetic profile in patients with suspected dysferlinopathy. Our results illustrate the importance of comprehensive analysis of related genes when performing genetic diagnosis for dysferlinopathy. We believe that the genes and molecules responsible for the cases in which diagnosis remained unresolved will be identified by future whole-exome sequencing projects. Rumiko Izumi: principal author, designed the study, analyzed and interpreted the data, drafted the manuscript. Tetsuya Niihori and Yoko Aoki: designed the study, analyzed and interpreted the data, and revised the manuscript. Toshiaki Takahashi: acquired and provided data, performed the Sanger sequencing, and revised the manuscript. Naoki Suzuki, Masaaki Kato, and Hitoshi Warita: revised the manuscript. Maki Tateyama: performed the immunohistochemical analysis of the biopsied muscles and revised the manuscript. Chigusa Watanabe, Kazuma Sugie, Hirotaka Nakanishi, and Gen Sobue: acquired and provided data. Masashi Aoki: designed the study, revised the manuscript, and acquired funding. This study was supported by an Intramural Research Grant (26-7 and 26-8) for Neurological and Psychiatric Disorders of NCNP; the grant on Research on Rare and Intractable Diseases (H26-intractable disease 037 and 082) from the Ministry of Health, Labour and Welfare of Japan; Grants-in-Aid for research on rare and intractable diseases from the Ministry of Health, Labour and Welfare of Japan (H26-nanchitou(nan)-ippan-079); Research Grant for Comprehensive Research on Disability Health and Welfare from the Ministry of Health, Labour and Welfare (H26-shinkei-kin-ippan-004); and Grant-in-Aid for Challenging Exploratory Research (26670436) from the Japanese Ministry of Education, Culture, Sports, Science and Technology. Dr. Izumi, Dr. Niihori, and Dr. Takahashi report no disclosures. Dr. Suzuki has received research support from Grant-in-Aid for Challenging Exploratory Research (26670436), Scientific Research B (25293199), and Young Scientists A (15H05667) from the Japanese Ministry of Education, Culture, Sports, Science and Technology. Dr. Tateyama has received honoraria for lecturing from Daiichi Sankyo company and has received research support from Japan Society for the Promotion of Science (JSPS). Dr. Watanabe, Dr. Sugie, and Dr. Nakanishi report no disclosures. Dr. Sobue has served on the scientific advisory boards of Kanae Science Foundation for the Promotion of Medical Science, the Naito Science Foundation, and the Takeda Foundation; has served on the editorial boards of Brain, Degenerative Neurological and Neuromuscular Disease, Journal of Neurology, and Amyotrophic Lateral Sclerosis; and has received research support from the Ministry of Education, Culture, Sports, Science and Technology of Japan; the Ministry of Welfare, Health and Labor of Japan; and the Japan Science and Technology Agency, Core Research for Evolutional Science and Technology. Dr. Kato reports no disclosures. Dr. Warita has received research support from Grant-in-Aid for Scientific Research (26461288, 25293199, and 23591229) and Grant-in-Aid for Challenging Exploratory Research (26670436) from Japan Society for the Promotion of Science (JSPS), Japan. Dr. Y. Aoki has served on the editorial board for the Journal of Human Genetics and has received research support from the Japanese Foundation for Pediatric Research, the Japanese Ministry of Health Labor and Welfare, the Japan Society for the Promotion of Science (JSPS), and the Japan Agency for Medical Research and Development (AMED). Prof. M. Aoki has received research support from the Japanese Ministry of Health Labor and Welfare, NCNP, and the Japanese Ministry of Education, Culture, Sports, Science and Technology. Go to Neurology.org/ng for full disclosure forms. The authors thank the patients and their families and are grateful to Yoko Tateda, Kumi Kato, Naoko Shimakura, Risa Ando, Riyo Takahashi, and Chikako Yaginuma for their technical assistance. The authors also acknowledge the support of the Biomedical Research Core of Tohoku University Graduate School of Medicine. Accepted in final form October 26, 2015.
. Genomic organization of the dysferlin gene and novel mutations in Miyoshi myopathy. Neurology 2001;57:271–278.
. Dysferlin is a plasma membrane protein and is expressed early in human development. Hum Mol Genet 1999;8:855–861.
. Defective membrane repair in dysferlin-deficient muscular dystrophy. Nature 2003;423:168–172.
. Dysferlin interacts with annexins A1 and A2 and mediates sarcolemmal wound-healing. J Biol Chem 2003;278:50466–50473.
. Muscular dystrophy with marked Dysferlin deficiency is consistently caused by primary dysferlin gene mutations. Eur J Hum Genet 2011;19:974–980.
. Dysferlin is a surface membrane-associated protein that is absent in Miyoshi myopathy. Neurology 1999;53:1119–1122.
. Intracellular accumulation and reduced sarcolemmal expression of dysferlin in limb—girdle muscular dystrophies. Ann Neurol 2000;48:902–912.
. Protein and gene analyses of dysferlinopathy in a large group of Japanese muscular dystrophy patients. J Neurol Sci 2003;211:23–28.
. The sarcolemmal proteins dysferlin and caveolin-3 interact in skeletal muscle. Hum Mol Genet 2001;10:1761–1766.
. Mutation in the caveolin-3 gene causes a peculiar form of distal myopathy. Neurology 2002;58:323–325.
. Mutations in Czech LGMD2A patients revealed by analysis of calpain3 mRNA and their phenotypic outcome. Neuromuscul Disord 2004;14:659–665.
. Analysis of histopathologic and molecular pathologic findings in Czech LGMD2A patients. Muscle Nerve 2006;33:424–432.
. Analysis of the UK diagnostic strategy for limb girdle muscular dystrophy 2A. Brain 2007;130:3237–3249.
. Dysferlin mutations in Japanese Miyoshi myopathy: relationship to phenotype. Neurology 2003;60:1799–1804.
. Clinical features and a mutation with late onset of limb girdle muscular dystrophy 2B. J Neurol Neurosurg Psychiatry 2013;84:433–440.
. ANNOVAR: functional annotation of genetic variants from high-throughput sequencing data. Nucleic Acids Res 2010;38:e164.
. A method and server for predicting damaging missense mutations. Nat Methods 2010;7:248–249.
. SIFT: predicting amino acid changes that affect protein function. Nucleic Acids Res 2003;31:3812–3814.
. Clinical, pathological, and genetic mutation analysis of sporadic inclusion body myositis in Japanese people. J Neurol 2012;259:1913–1922.
. Molecular and cellular basis of calpainopathy (limb girdle muscular dystrophy type 2A). Biochim Biophys Acta 2007;1772:128–144.
. Secondary reduction in calpain 3 expression in patients with limb girdle muscular dystrophy type 2B and Miyoshi myopathy (primary dysferlinopathies). Neuromuscul Disord 2000;10:553–559.
. The clinical course of calpainopathy (LGMD2A) and dysferlinopathy (LGMD2B). Neurol Res 2010;32:41–46.
. Comparing clinical data and muscle imaging of DYSF and ANO5 related muscular dystrophies. Neuromuscul Disord 2014;24:1097–1102.
. Protein studies in dysferlinopathy patients using llama-derived antibody fragments selected by phage display. Eur J Hum Genet 2005;13:721–730.
. Dysferlin interacts with affixin (beta-parvin) at the sarcolemma. J Neuropathol Exp Neurol 2005;64:334–340.
. Reverse engineering gene network identifies new dysferlin-interacting proteins. J Biol Chem 2011;286:5404–5413.
. Membrane repair defects in muscular dystrophy are linked to altered interaction between MG53, caveolin-3, and dysferlin. J Biol Chem 2009;284:15894–15902.
. Dysferlin interacts with tubulin and microtubules in mouse skeletal muscle. PLoS One 2010;5:e10122.
. Dysferlin interacts with calsequestrin-1, myomesin-2 and dynein in human skeletal muscle. Int J Biochem Cell Biol 2013;45:1927–1938.
. Proteomic analysis of the dysferlin protein complex unveils its importance for sarcolemmal maintenance and integrity. PLoS One 2010;5:e13854.